A potentially safer way to reprogram cells. Ever since then soon-to-be Nobel Prize winner Shinya Yamanaka showed how to reprogram adult cells to an embryonic stem cell-like state labs around the world have jumped on that band wagon. But many of their experiments have not just been using those cells but rather looking for ways to make them more efficiently and possibly safer for clinical use. The four “Yamanaka factors” traditionally used to make what are now called induced pluripotent stem cells (iPSCs) include genes that can induce cancer. So, folks have been justifiably nervous about using cells derived from iPSCs in patients. Today in the journal Science two different Chinese teams report slightly different methods of using only chemicals to reprogram skin cells directly into nerves. One team worked at the Shanghai Institutes for Biological Sciences and the other worked at Peking University. “In comparison with using transgenic reprogramming factors, the small molecules that are used in this chemical approach are cell permeable; cost-effective; and easy to synthesize, preserve, and standardize; and their effects can be reversible,” Hongkui Deng of the Peking team said in a press release used to write a piece in the International Business Times. Stem cells in hair follicles may repair nerve. The base of our hair follicles contains skin stem cells as you would expect, but it also contains cells with markers suggesting they come from the area of the embryo known as the neural crest. A team at the University of Newcastle in the U.K. tested those cells to see if they have stem cell properties and they do. They were able to use those cells to create Schwann cells, support cells that our bodies use to repair nerves and help with certain systems like sensation. The team’s Schwann cells interacted with nerve cells in lab dishes the way natural cells do in the body. They showed that the cells can indeed become Schwann cells. The researchers now want to see if their cells can repair nerve damage in an animal model. Prior work at Stanford had turned embryonic stem cells into liver cells. Drink up. 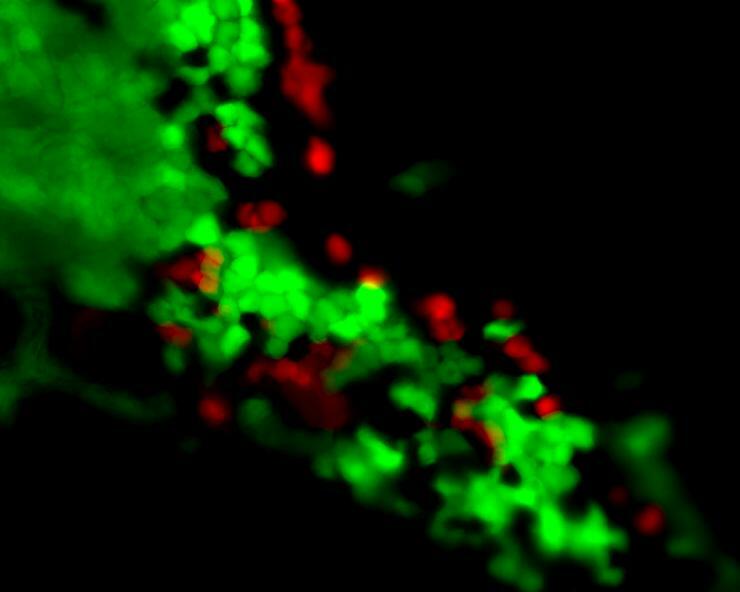 Liver stem cells found. The liver creates new liver cells quite readily, whether damaged by alcohol or other factors. But no one has known exactly where the new cells come from, with most researchers assuming the remaining health cells divide to create new tissue. But a team at Stanford suggested that the liver works too hard for that to be the case. In order to remove all the toxins that come its way adult liver cells have amplified certain chromosomes, and team leader Roel Nusse said that would make them unable to divide and create new cells. So, his team set out to track down previously elusive liver stem cells. They bred mice that had cells that would have a green florescent glow if they carried a protein usually found only on stem cells. They indeed did find stem cells and tracked them as the animals matured and saw them both divide to create more stem cells and mature into adult liver cells. The Hughes Institute issued a press release and the International Business Times wrote the story and illustrated it with a photo from CIRM’s Flickr site.